Nearly two decades ago as a pre-teen, I used to deliver several hundred copies of the Scarborough Mirror, a free community paper in the northeast corner of Toronto twice a week. At the time, this was the go-to source of information for community news, and it filled an information need for those who could not afford a newspaper subscription or access the internet at home. But on a recent trip to Canada, I witnessed how the newspaper has been transformed. The Mirror is now delivered once a week rather than twice. It is stuffed with roughly a pound of advertisements, and each edition has fewer than ten news articles. Moreover, each of those articles is very short on content. On the other hand, some things remain the same. The lead white reporter from a decade ago continues to cover a community sprawling with immigrants where residents now represent over 100 languages. The Scarborough Mirror’s transformation is due to a number of factors, including an outdated revenue model and an inability to evolve and adapt to changing readership demographics. In this way it is confronting challenges similar to those many local news organizations are facing across North America, and in fact, across the globe. If news organizations continue to use the decades old handbook, hires, and practices for operating in a new media paradigm they will continue to become less relevant. And this will result in expanded areas of news poverty—areas that do not receive sufficient coverage. A much more comprehensive strategy is needed to reimagine local news organizations and reinstate a covenant of trust with audiences. 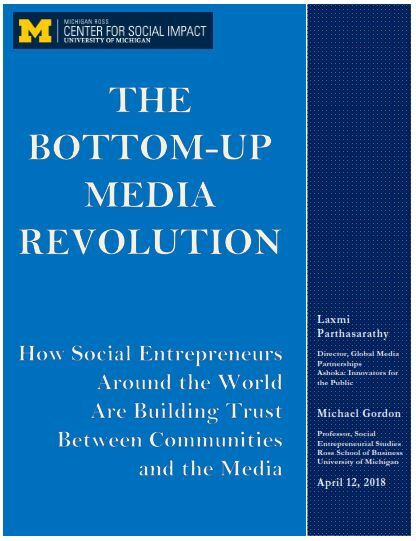 In a new report “The Bottom-Up Media Revolution,” published by the University of Michigan, Michael Gordon and I argue that even as polarization, corporate consolidation, and eroding trust between communities and the media threaten to damage democracy, there are inspiring innovators hard at work repairing it. These innovators are known as social entrepreneurs, and they marshal the resources of local communities to solve local problems. Our study was developed through a research collaboration between the University of Michigan and Ashoka—the world’s largest network of leading social entrepreneurs. Because many of the 3,500 Ashoka Fellows (Social Entrepreneurs) that Ashoka selects and supports are in the media sector, the organization sits on a treasure trove of data on transformative media innovations. We analyzed this data to understand how social entrepreneurs around the world are trying to improve the media landscape and assessed the most successful approaches. Many of these social entrepreneurs, representing over 22 countries and working in over 30, operate in media markets that are very different from those in Toronto. Many of the examples are located in repressive media environments, limited by a lack of freedom of speech, restricted access to information, and a dominant narrative controlled by those with agenda setting power. 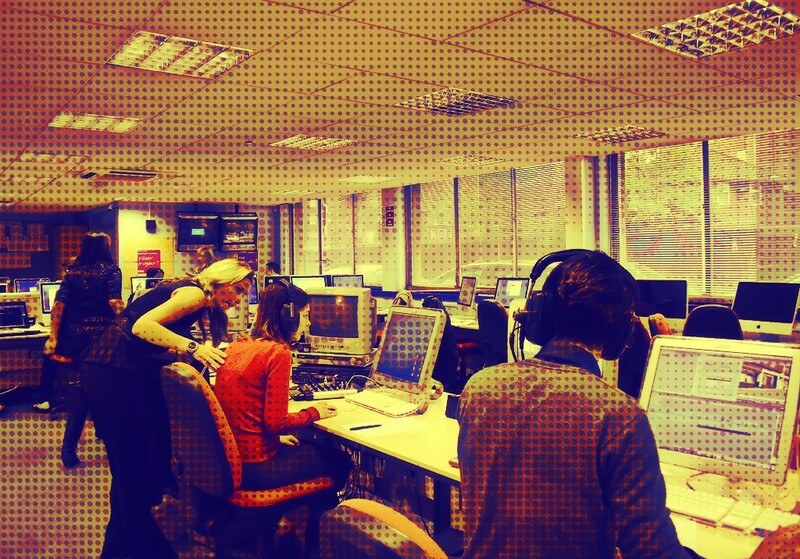 Yet, their overarching goals and approaches can still be applied to newsrooms around the world. For example, over 80 percent of the high impact media Fellows featured in the report empowered and showcased audiences as changemakers. A unique example of this is Citizen Matters, a local newsmagazine in Bangalore that provides information to local citizen groups and reports on issues at a hyperlocal level. Founded by Meera K, Citizen Matters serves as a catalyst for change by capturing citizen complaints such as waste management or clean water to inform its investigative reporting and position the reader and complaint contributor as a micro-funder of the story. This fosters accountability in the reporting and ensures that the published articles continue to add value by addressing community concerns. This approach is employed by social entrepreneurs working in many challenging media markets. The study also found that many social entrepreneurs—over 30 percent of those selected—relied on training programs to improve the news media’s representation of the communities they serve. For example, social entrepreneurs are decentralizing media coverage by encouraging the contributions of young readers who are engaged in their communities. In Egypt in 2014, Ahmed El-Hawary launched Bashkatib, an online platform that publishes content from local media outlets developed and published by Egypt’s youth. Ahmed El-Hawary has designed a two-year program to provide basic journalism training for youth in marginalized areas. These youth then have the opportunity to cover stories that are relevant to them and their peers, develop their own community media outlets, and distribute their publications locally. Though Egypt is home to an incredibly centralized, Cairo-based and government-controlled media sector, several of Bashkatib’s hyper-local pieces have been picked up by the mainstream media, slowly shifting dominant narratives. Over 50 percent of the social entrepreneurs in our study worked on improving media representation of marginalized voices. An example of this is Prachatai, an online newspaper and web board in Thailand, founded by Chiranuch Premchaiporn. It has helped alternative narratives and opinions to emerge despite heightened censorship by the Thai government following the Computer Crimes Act of 2007. Chiranuch has created a space wherein Thai citizens can freely express and discuss their opinions, while also creating more demand for such a platform. Prachatai has trained roughly 100 citizens to write articles for the site so that citizens can help determine the news agenda. During political demonstrations in Thailand in 2010, comments from her newspaper and web board were referenced by Thai mass media, allowing uncensored information and opinions to emerge in the public sphere. In this way, this news website is constantly challenging censorship. Laxmi Parthasarathy is the Director of Global Media Partnerships for Ashoka: Innovators for the Public, She is also a Media Development Professional and Vice Chair of the board of Crossroads International. Follow her on Twitter at @Laxmisarathy.